Hat Yai (หาดใหญ่; also Had Yai, Hadyai) is the fourth largest city in Thailand and is located on the Southern Gulf Coast. It is an extremely popular tourist spot for Malaysians and Singaporeans on holiday and weekends. As a word of caution, you will see a lot of touristy stuff here. As the transit city to the rest of Thailand, this city is a must stop. Even if you want to go off the beaten path, this city has hidden gems thet shouldn't be missed. Note that prices are high here (however not as high as on Thailand‘s popular islands). After all, this city is built on tourism anyway. Long story short, Hat Yai is built on tourism. Before 1922, present Hat Yai doesn't even exist, except for a small village called Khok Su-Met Choon. A Hakka Chinese guy named Mr Khun Niphat Chinnakorn invested heavily on building railway lines from Nakhon Si Thammarat to Pattani. Khok Su-Met Choon is chosen to be the new site for the railway station we see today because the existing railway station at that time is prone to flood. Khok Su-Met Choon changed its name to Hat Yai, and it grew so fast the population soared from just four in 1922 to more than 380000 today. Note that Hat Yai is actually NOT the capital of the province; that title goes to Songkhla. 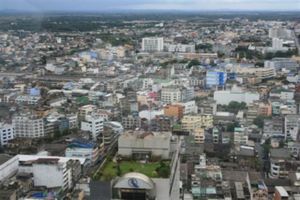 However, Hat Yai is the investment and business magnet of the province which explains the size of the two cities. Thanks to tourists from neighboring countries, this city is filled with tourism-related businesses. Hotels, markets, massage parlors and a not-so-authentic floating market are built on this land, making it a sweet spot for a transit and lots of photos. Food hunting is a must here. Southern Thailand especially Hat Yai is known to have great fried chicken eaten with sticky rice and Thai chilli sauce. Sadly, with growing tourism economy, grows the 'scamming mentality' of which some of the locals think it's OK to charge more to foreigners, and this problem isn't limited to Hat Yai alone- it is a Thai problem. Some people are known to charge more in the downtown area to go to the local attractions a little bit out of city, and it gets worse if you can't speak Thai (or Malay, sometimes). Taxi rides to Hat Yai city can be found at the airport entrance for which the drivers will ask around 250 baht,you also can use the airport limo service which costs 300 baht. A minivan service into the city costs 100 baht. A blue colored songthaew runs into town for 30 baht and can be found at the far end of the parking lot. From Phet Kasem Rd, Hwy 4135 (Sanambin Panij Rd) links to the airport. Car rental is available on arrival from Avis. There are no official currency exchange offices in the airport. Staff of limo/minibus booth will exchange ringgits or dollars for you (or accept them for their service), but the exchange rate will be poor. There are daily flights to/from Bangkok Suvarnabhumi Airport (BKK) on Thai Smile . Hat Yai (HDY) is also connected daily to Bangkok Don Mueang Airport (DMK) by Nok Air, Thai AirAsia  and Thai Lion Air . Other than Bangkok there also domestic flights to other Thai cities such as Phuket, Utapao (Pattaya), Chiang Mai, Chiang Rai, Khon Kaen and Udon Thani. Fly Scoot [www.flyscoot.com] operates daily flights to Singapore, and Air Asia to Kuala Lumpur and Chiang Mai. Hat Yai is on the southern line connecting Bangkok to Butterworth and Kuala Lumpur in Malaysia. To/from Bangkok: Six trains daily to and from Bangkok. Two Special Express trains depart Bangkok at 15:10 and another one depart at 22:50; while the slower Rapid trains depart at 13:00 and 15:35. There is also a new Chinese-built train that depart at 14:45. Trains go via Surat Thani, Chumphon, Hua Hin etc. A 3rd class ticket with reserved, upholstered seat sets you back 259 baht (Hat Yai-Bangkok) on ordinary trains and slightly more for Rapid/Express trains. Buy tickets directly at the respective railway stations, surcharges are imposed if bought at other agencies! To/from Sungai Kolok, Thailand: Three ordinary trains from Sungai Kolok daily departing at 06:30, 09:00 and 12:25. Trains to Sungai Kolok depart at 07:55, 10:18 and 12:33. Expect delays. There are also more expensive trains but the ordinary ones are great if you want to see the countryside. 42 baht per head to/from Sungai Kolok. Notice the presence of military officers. Don't worry; even though most governments discourage people to go to the Deep South, taking the ordinary train is a great way to understand the situation. You can expect vendors selling halal food on board along the journey. Surat Thani 3rd class tickets cost 55 baht, but the journey takes 7 hours! Good for stunning views of the countryside. See timetable at railway station. Sleeper cabins 1st class, 2nd class air-con & fan sleeperettes, and 3rd class (now upholstered seats!) are available. Note that Malaysian time is one hour ahead of Thai time: noon in Thailand is 13:00 in Malaysia. Be sure and check the departure time as Thai train schedule may show arrival in Malaysian time and departure in Thai time. Hat Yai has a large bus station located near the Diana Department store (N 06° 59.699 E 100° 28.962). If you are arriving at this station, the main gate is near the baggage check, toilets, a small store and the buses to Bangkok. A blue songtaew will come by at a stop just outside the gate and can take you downtown (train station). From this gate you can see the Central Festival mall to the right. The main superhighway 4 goes by the front of this mall with more songtaews in both directions. If you are going downtown, the songtaew makes a hard right at the traffic light in front of the V.L. Hat Yai hotel and you must get off 100 meters or so before the light; see Get Around, by songtaew below. Buses can be taken to all major towns in the south of Thailand and up to Bangkok. Depending on the route, different classes of bus are available. These range from local orange colored buses without air-conditioning to luxurious 24-seat coaches with toilets and reclining seats. Left Luggage is open 7 AM to 9 PM and costs about 1 USD or 35 baht per medium sized suitcase. Toilets are free, paper is not. A 7-11 is just outside the gate to the left, down about 40 meters. Buy tickets only from the ticket counters, do not allow yourself to be directed to agencies by touts (this includes tuk-tuk drivers in the bus station). You will pay more and most likely get a later time. Other scheduled, inter-provincial buses serving Hat Yai: Surat Thani, Phuket, Satun, Trang, Krabi Town, Nakhon Si Thammarat. Bus to Songkhla goes past the clock tower along Phetkasem Rd (ถนน เพชรเกษม), at the intersection close to Montri 1 Rd (ถนน มนตรี 1). To/from Bangkok: Air-con buses by The Transport Co. Ltd (บริษัท ขนส่ง จำกัด (บขส. ), bor-kor-sor) run between Bangkok southern bus terminal (สายใต้, sai-tai) and Hat Yai bus terminal daily. The distance is ~954 km and normally takes 12 hours. 24 seat VIP bus (พิเศษ, phiset) costs 1,072 baht, departs from Bangkok at 17:00, 18:00, 19:00 and 20:00. For the return, departures at 16:00, 17:00, and 18:00. 32 seat Class 1 bus (ม1พ) costs 828 baht, departs from Bangkok and Hat Yai at 17:30. 47 seat Class 2 bus (ม2) departs from Bangkok at 07:00, 17:00, and 21:45; Hat Yai at 08:00, 15:30, and 17:00 for 535 baht. To/from Kuala Lumpur: There are several Malaysian bus companies that go to/from Kuala Lumpur, you can get tickets either at tour agents or from the bus company shop. Cost of ticket varies depending on company and time of departure. Konsortium Bas Ekspress Semenanjung, 32, Prachathipat Rd, Hat Yai. Tel. +66 74 351 280 and +66 74 351 281 have 5 buses every day which leave Hat Yai to Kuala Lumpur, departure at 09:00, 09:30, 10:00, 12:00, and 19:00. Tickets cost around 520 baht and it's a 10 hour journey if you factor in waiting at immigration, a meal stop, and traffic when you arrive in Kuala Lumpur. From Kuala Lumpur, 5 buses every day depart from Pudu Sentral at 09:10, 22:00, 22:30, 23:00 and 23:30. RM50-60. Can buy online. Bus can drop at Hat Yai Bus Station. Alisan Golden Coach Express, 17/1 Chee Uthit Road (on Google Maps it is called Thanon Sheutit), Hatyai, Songkhla, 90110 Thailand. Tel: +66 74 243 775 have 3 buses every day which leave Hat Yai to Kuala Lumpur. Departures at 09:00, 11:00, and 19:00. Tickets cost around 400 baht and it's a 10 hour journey if you factor in waiting at immigration, a meal stop, and traffic when you arrive in Kuala Lumpur. To/from Penang: Scheduled air-conditioned minivans leave on the hour during the day from Georgetown's Lebuh Chulia (parking lot of E & A Hotel) The fare is presently set at RM30-35, advance booking is recommended. The journey including border formalities requires about 3-4 hours. To/from Ipoh: There is a daily bus from Ipoh at 12:30 going to Hat Yai, departing from the long-distance bus terminal, cost RM45. To/from Singapore: The main terminal for buses to and from Thailand is at the Golden Mile Complex, 5001 Beach Rd. It's at the northeastern end of Beach Rd, where it meets Crawford St. The lavender MRT station is within walking distance A number of travel agents specialising in buses and tours to Thailand operate from there. Grassland Express (Tel: 6293 1166) has a bus at 19:00 to Hat Yai for 55 Singapore dollars. Other operators at Golden Mile complex: Transtar Travel, Tel. 6299 9009; Sri Maju, Tel. 6293 4160; City Line Tour, Tel. 6396 6969; Konsortium, Tel. 6392 5000; Star Mart Express, Tel. 6396 5681/6396 5682; Five Star Tour, Tel. 6294 7011; Alisan, Tel. 6292 2112. There are three border crossings to choose from, all easily accessible from Hat Yai. Dannok, Padang Besar and Sungai Kolok. To/from Dannok: Vans run from Hat Yai right up to the Thai immigration complex in Dannok in Sadao district. Journey time is about one hour and the fare is 55 baht. Vans leave Dannok in front of the 7-11 store on the left side of the street after leaving the immigration complex. Note that the distance between the Thai and Malaysian immigration checkpoints is about 1 km, quite a distance to walk in the heat. You can take a motorcycle taxi between them. Bus and minivan to the border stop running around 18:00, so ask if there will be a return before boarding. To/from Padang Besar: Regular buses depart Hat Yai's bus terminal for Padang Besar (only to the Thai side). Journey time is about one hour, price 50 baht (Aug 2012). If you are crossing to Malaysia immediately, ask to be dropped off right at the gates of the Thai immigration complex before your enter town. From Hua hin: 2 Air-con buses run between Bus terminal at Soi 69 in Hua hin and Hat Yai bus terminal daily. . These departs from Hua hin at 19:30 and 20:30 from Hua hin, and take 8 hours. Minivans connect to and from all major locations in southern Thailand with Hat Yai. Where they depart from depends on the destination but the locals will be able to point you in the right direction. They are generally cheap and quicker than the buses but often overcrowded thus making them uncomfortable and dangerous. There are also minivans connecting Hat Yai to Penang in Malaysia. There is no standard price, different agencies quote prices between 400 baht and 650 baht. Cathay Guesthouse, which is not far from train station, has probably the best rate set at 400 baht. Agencies near the bus terminal usually ask for 450-500 baht. Minivan times to Penang are 09.30am, 12.30pm and 03.30pm. Journey takes about 4-5 hours, depending on time spent at Sadao border. Tickets from Penang to Hat Yai are cheaper, about 35 Malaysian ringgit. The numerous songthaews of different colors mostly run the same route which is the main 4 lane super highway that runs around the city, from right outside the V.L. Hatyai hotel (cross the street and move down a little for the driver) to around the traffic circle, past the Big C, post office, a hard right, past the Tesco superstore and about 2 km more to the bus station, just before and 2 blocks behind the central festible shopping mall (and they run still further). A blue songtaew stops right outside the gate at the bus station, both directions, near the central festible mall and can take you downtown. Fee the whole route is 10 baht one way. Tourist fare will be verbally quoted at 20-40baht, with their own cartel night surcharge. Say or write the destination to the driver if in doubt. Taxis (tuk-tuks and motorbikes) are abundant in Hat Yai. They are available from any hotel. A ride within the city costs 20-60 baht. Ask the person at reception to write down the Thai address for you and show it to the driver. Rides to places outside the town are negotiable. Shared taxis going outside town can be found at the old market. Don't be pressured into getting into a tuk-tuk when you're first quoted a fare. Ask for the total fare of your travel group, and be mindful that some drivers might actually quote a fare per passenger instead of the whole group. If you feel the quoted fare is out of the norm, smile and walk away. Plenty of options exist along the street - those outside hotels or malls are happy to overcharge clueless tourists. With Grab entering the transport scene, days of tuk-tuk cartels tarnishing the image of Thailand will be over soon. In February 2014, Hat Yai Inter Top Tour - 150 Niphat-Uthit 3 Rd (Cnr. Manasruedee) has one bike for rent, for 300 baht, passport photocopy and no deposit. The Cathay Guesthouse rents motorbikes starting at 200 baht per day for semi-automatics. Malay and English spoken. In January 2014, they cost already 250B. They only accept customers who leave their passport. There's a place close to the Genting Hotel about 2 km east of the train station that rents out motorbikes. +66 87 293 4695. You can rent a used motorbike or a scooter in some repair shops. For example there is one at 47, Thanon Nipatuthit 1. The owner speaks English, he is a decent man, so better be careful with the motorbike otherwise he will stop renting them out. His tel +66 81 328 7625. Normally he would require your passport as a deposit and 250 baht a day for a scooter. NEVER, EVER GIVE YOUR PASSPORT AS A DEPOSIT, in Thailand or anywhere else! A copy, signed with a note indicating the purpose of the copy has to do it. If you give your passport away you will have to pay whatever they ask to get it back in the event something happens. Not even the police will get the passport back to you before you have paid. And they ask for a lot more than just repair costs! Hat Yai Cable Car is a recent addition to the Hat Yai Park, together with Hat Yai Observatory. There are two stations: a station at Phra Buddha Mongkol Maharaj (พระพุทธมงคลมหาราช) and another at Thao Maha Phrom (ท้าวมหาพรหม). The second phase will add two more stations at the playground and Guan Yin statue, connecting four stations altogether. Open daily 09:00-20:00. 200 baht fare. Hat Yai Ice Dome near the main entrance of Hat Yai Park. A seasonal display of ice sculptures by sculptors from Harbin, China. Open daily 09:00-21:00. Adults 300 baht, children 150 baht. Hat Yai Lantern near and alongside the lake in the Hat Yai Park. Hat Yai Lantern Festival is held annually at the beginning of the year. The 2012 festival was held from January 1 to April 30. Open daily 17:00-23:00. No entrance fee. Hat Yai Municipal Park (สวนสาธารณะเทศบาลเมืองหาดใหญ่) or Hat Yai Park, , on Kanchanawanit Rd, is 6 km from the city centre on the Hat Yai-Songkhla highway. It is the major recreation for the people of Hat Yai and surrounding areas as well. The park is full of beautiful flowering plants, with a pavilion in the middle of the pond, aviarium, and food stalls. At the foot of the hill near the aviarium stands a statue of King Rama V. There is a Brahman shrine at the hilltop. And at the southern foothill near the boy scout camp stands the jade statue of Guan-yin, the Chinese Goddess. Hat Yai Observatory is Hat Yai's deepsky observation for science and astronomy. Located near Phra Buddha Mongkol Maharaj in the Hat Yai Park. Open daily, 09:00-20:00. Klong Hae Floating Market is located in Wat Klong Hae. Sells mainly local food. Open on Friday, Saturday and Sunday, 15:00-20:00. Ton Nga Chang Waterfall (น้ำตกโตนงาช้าง) is located in the Ton Nga Chang Wildlife Sanctuary. It is one of the beautiful waterfalls of the south, about 26 km from the city. Follow the Hat Yai-Rattaphum Rd for 13 km, then turn left at Ban Hu Rae for another 13 km. This waterfall has seven levels, the third level is the most beautiful and is named after the waterfall. At the third level the stream separates into two, resembling the elephant’s tusks. Treks have been provided for more adventurous tourists. One can hire a tuk-tuk to the waterfall for two to three hours at 300-400 baht, or one can take the minibus from the fresh market (Talat Sot Thet Sa Ban Hat Yai). Be aware that Thai consider the waterfall a recreation area. Whole families are traveling there on the weekend, and you'll see a lot of people having fun in the water. If you want to join in, pack a swim-suit. Also keep in mind, that foreigners are expected to pay a considerably higher fee to enter the area (Dec 2012: adults 200 baht, children 100 baht). Wat Hat Yai Nai (วัดหาดใหญ่ใน) on Phetkasem Rd, near Khlong U Taphao Bridge, is the site of a large reclining Buddha measuring 35 m long, 15 metres tall, and 10 m wide, named Phra Phuttha Hattha Mongkhon, believed to be the third largest reclining Buddha in the world. It is revered by both Thai and foreign tourists. Chinese New Year. With sizeable Thai Chinese population, Chinese New Year is celebrated everywhere in Hat Yai especially in the city centre. Songkran Festival. The festival marks Thai New Year, which is traditionally celebrated from 13 to 15 April. In recent years, the festival has been held as Hat Yai Midnight Songkran to attract visitors. Loi Krathong. Held in November. Visa Run - If you need to extend your stay in Thailand another 15 days, you can cross the border at Dannok, near Sadao. Getting there from the airport is easy and takes about 2 hours. From the airport walk straight out into the parking lot to the parking lot ring road. You can wait here for a light blue songthaew to take you into town and get dropped off at The Plaza for 13 baht. The ride takes about 20-30 minutes. You can also take an airport taxi into town. At The Plaza, you can find a van waiting just across from the TOT office, which makes regular trips to Dannok. If you can't find it, just say "Sadao" or "Dannok" to people till they point you the right way. The trip is 60 baht, and vans leave once they are full. The trip should take about 1 hour 30 minutes. It will drop you off near the border at Dannok and you can just walk to exit Thailand. You will be approached by motorcycle drivers who will offer to take you to the Malaysian side. Walking takes about 10 minutes, so it could be worth it to pay 20 baht each way if you are in a hurry. If you have time, a stop at the duty free shop is worthwhile. Minivans returning to Hat Yai depart from outside the 7-11 in Dannok. Please keep in mind that back-to back stamps are only allowed for a total stay of 90 days within any given 180 day period of time! This contributor exited Thailand at the Aranyaprathet/Poipet Cambodian border on 5 December 2017 and was told by the immigration officer that only two land entries per calendar year are allowed. This may only be true at this exit point and not at Dannok, be careful, ask on exit. A 60-day tourist visa can be obtained in Penang, Kota Bharu and in Kuala Lumpur at the respective Thai Consulates/Embassy. In Penang 60-day tourist visas cost generally 110 ringgit. Bring 2 photographs. A copy of passport main page is required. It is possible to copy it in a high school library nearby. To get there: take a bus no 1 from Komtar (1 ringgit) down Jalan Burma. After 10 minutes get off at the crossing with Cantonment Rd, turn left and walk down Cantonment Rd for 10 minutes and turn right to the Thai Consulate. Open from 09:00-12:00 and you will receive your tourist visa after 15:30. While waiting it's worth taking a bus ride to Batu Feringgi Beach (2 ringgit). You can also find visa services in Little India and Chinatown for about 20 ringgit (will also be ready after 15:00). Cost is 280 baht/30 ringgit one-way to Georgetown (with mini bus) and usually lets you off in Little India. There were return buses as late as 16:00 (as of May 2009). Thai Massage - No trip to Thailand would be complete without a Thai massage and Hat Yai is one of the best places to get one. Some of the many good places are the Garden Home Hotel or Hat Yai Central Hotel. The rooms are nicely decorated and provide a soothing environment to go with a good massage. Ask the doorman at any good hotel for a recommendation if you want to avoid the more dodgy massage places. Dentist Prince Songkhla University's faculty of dentistry offers very good & reasonably priced treatments!! But always put a few notes in the collection box. Government-operated hospital, so expect to wait a while. There are numerous offices of Thai banks around the city, as well as private Chinese money exchangers. Exchange rate in the latter for Malaysian ringgit may be significantly better than in the banks. ATMs are abundant in Hat Yai, although most of them, as everywhere in Thailand, do charge 150 baht fee for foreign card transactions. Aeon bank (the only one which consistently doesn't charge that) has ATMs near their office in the shopping/office center near the southern end of Nipatuthit 3 road, just to the left from the Tourist police sign, and easy walking distance from the city center. ASEAN Market (Poet tai) - Located next to Hat Yai Bus Station. Wide market famous for second hand brandname clothes, bags and shoes, but interesting locally designed new clothes and some vintage decorative stuff can be found here as well. Lot of food stalls inside. Wednesday to Sunday, 17:00 to 22:00. Kim Yong Market - Located at Supasarn Rungsan Rd. This is the most attractive & famous place for shopping. There is plenty of food, home appliances, chocolate, cosmetics, watches, CD games, etc. Suntisook Marketplace - Located at Nipat 1, 2 & 3. Sells the same products as the Kim Yong Market. Lee Garden Plaza - The most popular mall for Thai teenagers. Restaurants include Sizzler, Swensen's, McDonald's and Fuji among others. Shops inside sell books, clothes, mobile phones and souvenirs. There is a multiplex cinema and a games complex which also includes Karaoke booths. Central Department Store Hat Yai - Probably Hat Yai's most upmarket store. Clothes, cosmetics, books, household goods and there is a TOPS food supermarket on the highest floor. Robinson Department Store Hat Yai - Located near the Hat Yai train station. Odean Shopping Mall - Mostly clothes. Diana Shopping Mall - Clothes, mobile phones, restaurants and a bowling alley. Siam Nakarin Complex - Office supplies, furniture, restaurants, food center, IT/mobile phone and other small shops. Tesco Lotus Hat Yai 1 - Located near the Prince of Songkhla University, a large supermarket that sells food, clothes, household items and lots more. There are also a number of restaurants and smaller shops just outside the main supermarket. Tesco Lotus Hat Yai 2 - Recently open in Hat Yai Nai. Big C Extra Hat Yai - Formerly Carrefour. Has HomePro, Office Depot and several restaurants. Makro Hat Yai - Cash & carry wholesale. Central Festival Hat Yai - located near Makro Hat Yai. Is a large lifestyle and high end shopping centre in Hat Yai. Perfect for people to buy new clothes for New Year. Hat Yai is a touristy area with a flood of tourists from Malaysia and transit passengers. Local people seem to have a habit of overcharging all foreigners. The situation is one of the worst even compared to other touristy areas in Thailand. Learning a few Thai phrases usually doesn't keep you from being overcharged because Thais get used to Malaysians pretending to be a local by speaking a few Thai words. Talking about honesty doesn't mean much to the people in Hat Yai, but smiling will help. When you are asked to pay an inflated price, name any poor country, say you come from there, and insist that you don't have money. Sometimes it works. See how much local people pay for their food. It's unwise to ask them directly because they don't feel like betraying their neighbours by telling you the Thai price. Use common sense. Street vendors may charge you 25 baht for a skewer of BBQ'ed meat balls (Thai price ~10-12 baht). This is almost the same price as in Singapore, so you better walk away. Consult the staff in your guesthouse and ask them how much they pay for a particular food such as noodles and congee. Although not in the same league as Bangkok, there are a lot of different food options on offer in Hat Yai. Typical Thai street food is abundant. Big, international chain restaurants have branches in town offering Japanese and Western food. Ethnic Chinese from Malaysia and Singapore make up the bulk of Hat Yai's tourists so many restaurants and hotels cater primarily to them. Just opposite Lee Gardens (next to the Regency Hotel) you will see a restaurant which spit-roasts suckling pigs every day. Large, open-air seafood restaurants are also popular with Chinese visitors and the quality of seafood available in Hat Yai is good. Certain Chinese are vegetarians and the town has a good selection of small vegetarian restaurants that offer tofu and soy meat substitutes. Behind Regency Hotel and Lee Garden Hotel is a vermicelli shop with a Teochew-speaking female boss. It is open from 22:00-06:00. It's beside Duangchan St. There is a large resident Muslim population and some visitors from Malaysia are also Muslim so finding halal food isn't a problem. Gäp's Garten German Restaurant - A German beer garden style restaurant in Thammanunvithi Rd. not far from Tesco Lotus and Prince of Songkhla University just off the main road. Original German food (pork knuckle, Currywurst etc) and Pasta are on the menu, as well as a large variety of German and Belgian beers(Erdinger, Warsteiner, Duvel, Delirium tremens etc).Free WiFi. Open 4 p.m. to midnight. Run by a German and his Thai wife. Quiet beer garden as it is just off the main road. 516/1 Thammanunvithi Rd. (turn into Chantanajanusorn Rd.) Hat Yai, Songkhla. Phone: +66 86 9636551 REMARK: recently moved from the area around JB hotel. Bang Farang Restaurant - Nice small cozy restaurant at a walking distance from the bus station, ASEAN Market, or Green Way Market. Halal Thai food (spicy, not sweet Malay cuisine). Excellent kaeng som. Serves fresh fruit juices and coffee. Free high speed WiFi. Open 07:00 to 20:00. Closed Mondays. The cook/owner is married to a Muslim Frenchman. You can usually meet him on Saturdays. 32/7 Thungsao 2 Rd, Soi Khamuthit 4, Hat Yai. Tel: +66 82 439 9590. Daothiam - Friendly staff and tasty breakfasts. Thai & Vegetarian food. Grab a pad Thai and Chang among a collection of framed world currencies. Open daily 07:00 to 22:00. 79/3 Thammanoonvithi Rd, opposite Odean Shopping Mall. Tel: +66 74 243 268. Hamid Restaurant - Nice, clean, and good halal food. It is across the street from Lee Garden Hotel and there are a couple of other Muslim restaurants nearby. Lee Garden Plaza Hotel - (Tel. +66 7426 1111) The hotel has a 33rd floor restaurant with panoramic views of the city. It offers an excellent all-you-can-eat buffet, lunch and dinner. 169bhat per person for buffet and 89bhat for breakfast. Shop 192 (opposite 7-11) - Good Chinese food served here and very busy but worth waiting for some good fried stuff. Just brush up some of these basic words in Thai and let them know. Price ranges 50 baht and less. (192 Supasarnrangsan Rd, Hat Yai) Open at night from 18:00 on. Khao phat kai - fried rice with chicken. Khao phat mu - fried rice with pork. Khao phat pu - fried rice with crab meat. Khao phat kung - fried rice with shrimp. Ta-kun - If you're looking for cheap and good local food, try this small and very friendly little spot nearly opposite King's Hotel. Nipatutij 1 Rd a few blocks from the train station. Ya Lun Rou Ku Cha - Tel. +66 1 608 2829. For those who like to eat pork rib soup or Bak Kut Tea. The beer in Hat Yai is especially reasonable so enjoy a can of beer while you are there. More reasonably priced than what you pay at the outrageously overpriced duty-free shops. Bee Club - Live music, pool upstairs and decent food. Located downtown. Co Art - A cafe-style place to hang-out in the evening. There is a live band almost every day with internationally known cover-songs. Deep Wonder - Street side and downstairs bar. Live music. Across from The Pubb. Living Room 94 Thamanoonvithi Rd. At the site of the now-defunct Monkey Club. It's a nice place with fairly quiet atmosphere, and no longer a nightclub. Nakorn Nai - A stylish restaurant with free Wi-Fi. They serve very tasty Western food (pizza, pasta, beef stroganoff, breakfast) for reasonable prices. Oceania Out of the city centre, about 10 minutes by taxi from Lee Gardens and about 100 m north of the Hansa Plaza/Paragaon night entertainment complex in Hat Yai 'nai'. A beautiful open-air restaurant and bar set on 2 floors with a landscaped garden of waterfalls and palms, and soft lighting to boot. The kitchen is open until well after 02:00, serving decent Thai food at around 100 baht a dish. A large Heineken is 90 baht, with draft available also. The theme is quiet and romantic, ideal after an hour or two in the disco nearby. Live acoustic music accompanies the diners every night until midnight. Oceania closes when the last customers leave at around 04:00. The Post Laser Disc - Air-con and pool. Best band in town. Jack Coke, 80 baht. Farang hangout. On Thamnoon Vithi Rd. Sunrise Coffee (หอมกลิ่นกาแฟ) A nice little coffee shop offering a variety of coffee blends and smoothies; very cozy atmosphere. It is located on Sheutit Rd (ชีอุทิศ), opposite the Hakka Chinese Association and the D-Pan-Panya restaurant. The Swan, on Thamnoon Vithi Rd, one block from The Pubb. Nice atmosphere with books and 2 TVs with UBC. Jack Coke, 60 baht. A slight British pub feel. The West Side Saloon Can get crowded and very noisy. They have a good bar food menu. The only pub/bar in town that writes the prices on the menu excluding service charge and VAT. Can be a surprise when you get the bill. Travel agents around town can nearly always give better rates for hotel rooms compared to dealing directly with the hotel. Hat Yai has an abundance of accommodation. Tourism in Hat Yai consists mainly of the weekend trade from Malaysia and Singapore. Accommodation can be found very easily mid-week but hotels in the centre of town tend to get booked up for the weekends and Malaysian and Singaporean public holidays. In the budget hotel you may well be asked if you want 'company', but a shake of the head is all that is needed to decline: but don't be put off by the hotel because of it. Indra Hotel - Thamanoonvithi Rd/Next to Monkey Pub. Nice inexpensive place to stay near market and transportation (bus agents). It is recommend that you inspect a room before booking. Laem Thong Hotel - 46 Thamanoonvithi Rd, one block from railway station. Have LCD TV, WiFi (lobby only), elevator and cafe. Fan rooms (2 person) - 470 baht (October 2017). Twin single bed with aircond (2 person) - 620bhat (October 2017). 2 king size bed with aircond (4 person) - 820bhat (October 2017). Big size family room with aircond (up to 9 person) - 1300bhat (October 2017). A series of bombings in September 2006 that specifically targeted restaurants and shopping centres popular with visitors (and locals) killed two tourists. These were presumably placed by Muslim separatists. There were another 7 bombs in May 2007 in Hat Yai which killed one person. Strict security measures (bag searches, metal detectors) are to be expected in most gathering places. The latest bombing occurred on 6 May 2014. Despite all of the rare occurences, Hat Yai is still a good place to visit anyway even if you're alone. All you can do is be on the alert for suspicious activity and packages. Padang Besar - red local bus runs from Clock Tower plaza from 7:30am (possibly earlier). 44 baht (May 2015). Please note it is difficult to arrange further travel on Malaysian side, Plusliner coach runs only twice a day. The nearest bus station is in Kangar, 30km away. There is a local bus to Kangar but it's very infrequent. Penang - Minivans booked through any guesthouse or travel agency cost 380 - 400 Baht (May 2013) and take about four hours from Hat Yai. Departure times are 9:30, 12:30, and later. Kota Bharu- take a bus or minivan to Sungai Kolok. Cross border to Malaysia side and take a taxi around RM40. This page was last edited on 10 March 2019, at 03:01.